For our fathers used to correct us according to their own ideas during the brief days of childhood. But God corrects us all our days for our own benefit, to teach us his holiness. Now obviously no “chastening” seems pleasant at the time: it is in fact most unpleasant. Yet when it is all over we can see that is has quietly produced the fruit of real goodness in the characters of those who have accepted it in the right spirit. 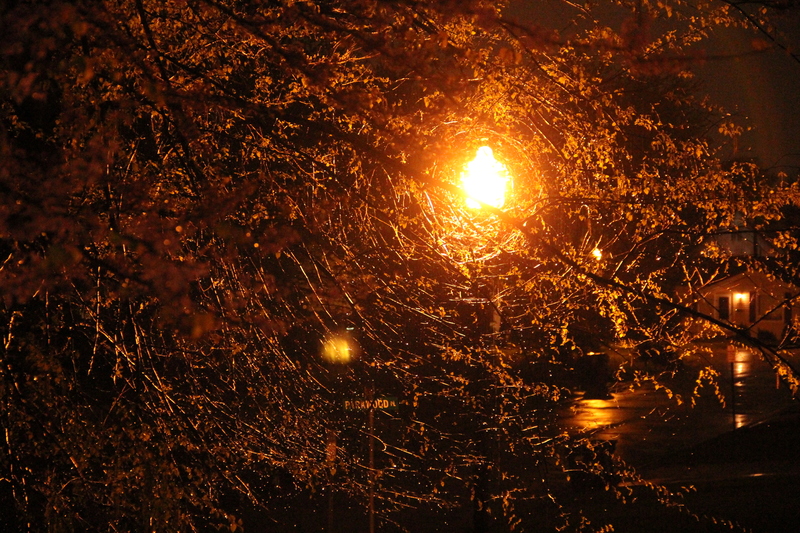 It was storming outside and I was restless inside, so I stepped out onto our porch. The ebb and flow of the swing was a shelter while the thundering darkness surrounded me. 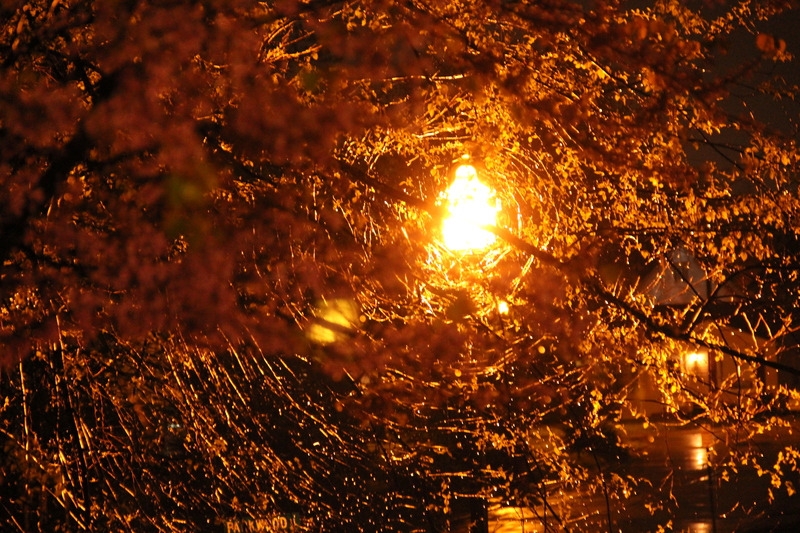 I glanced toward the street lamp and noticed this ring of lights reflecting in the branch of our river birch with the redbud blossoms in the foreground. I was mesmerized. 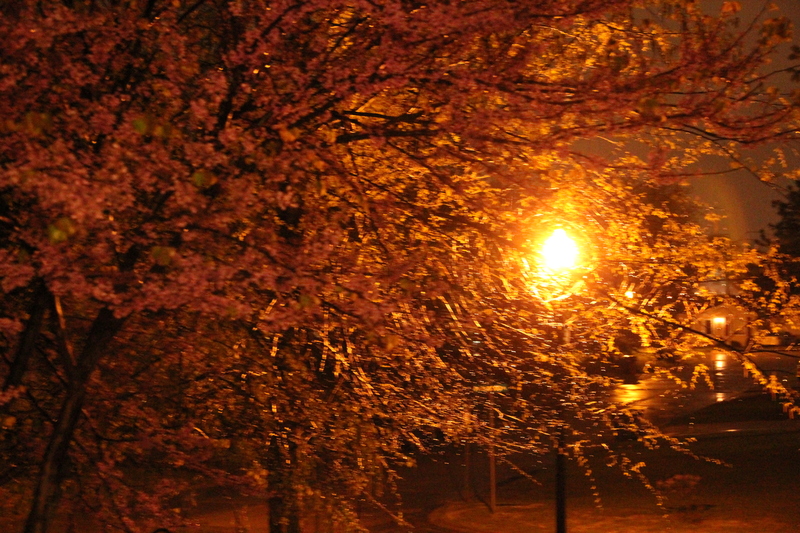 I was relieved to see such beauty in the midst of the rainy night. It felt like redemption in the middle of these days of refining grief. The next day, I read a Scripture with the word chasten in it. I was intrigued by this archaic word for discipline. A dictionary hunt was called for! I was surprised how the definition combined gardening terms with art technique. Usually words like chasten and refine make me cringe. And discipline does cause pain, but in the end it produces change. I never thought of pruning or refining as a style of art before. Imagery of cut off branches littering the ground and fiery furnaces scorching a piece of iron ore fills my mind’s eye. But when I started thinking like an artist, the act of pruning and refining produces shapely, ornate hedges in an English garden and shiny, amber blown glass forming at the end of a tube. God, as master sculptor is chastening me, chipping off the unwanted attitudes that detract from His holiness and goodness. He chisels off the pretense. He scrapes away the excess. He melts away the false. God, the refiner, is freeing me from what is “coarse, vulgar and uncouth.” Apparently, refinement “improves something by making small changes!” What a relief! The master artist takes His time with the me, not rushing to get a result. He gently snips off the unruly growth of disobedience. He polishes out a ugly spot of unbelief. And before I know it, He has enriched my life with His holiness and goodness, which I could never achieve on my own. Linking with Soli Deo Gloria Party! breathing deep…yes…resting in His loving process with me…thanks for stopping by!